October 1948 <clipping> W.C.T.U. TO HAVE FAMILY NIGHT TUESDAY The W.C.T.U. will have family night at 6:30 p.m. Tuesday, Oct. 19, at the United Presbyterian church. There will be a potluck picnic followed by a program. A film will be shown by Mrs. Marie Cox of Newton. Each family is asked to bring table service, sandwiches, and a covered dish. Members and friends of the W.C.T.U., the Y.T.C., and the L.T.L. are welcome. <clipping> Y.T.C. TO HAVE FAMILY NIGHT The October Meeting of the Y.T.C. will be held with the family night of the W.C.T.U. in the dining room of the United Presbyterian church on Tuesday evening, October 19, beginning with a cooperative supper at 6:30, followed by a special program at 7:45 p.m. A number of guests will be present from Newton who will show a group of pictures which should be of interest to everyone. A report of the state convention and special music by the Y.T.C. will add to the program. Everyone is asked to come and bring their friends. <clipping> W.C.T.U. HAD FAMILY NIGHT POTLUCK SUPPER The family night potluck supper of the WCTU held Tuesday at the United Presbyterian church was followed by a program, at which Mrs. Charles Whitely conducted the devotions. The Youth Temperance Council contributed two numbers. Mrs. Marie Cox of the Newton W.C.T.U., assisted by Mr. Cox, favored the group with a series of slide films. Each film began with a story, and was followed by an illustrated explanation of the physiological condition of the brain, eyes and muscles of the leading character at a dramatic moment. Other guests from the Newton W.C.T.U. included Mrs. Sabin, Mrs. Parks and Mrs. Niefert. <clipping> SOCIETY L.T.L. TO HAVE MEETING THURSDAY The Loyal Temperance Legion will have a meeting at the lirary Thursday after school, October 21. There will be a fire prevention program and all the members are asked to bring a friend. All the boys and girls with their friends and parents are also invited to the cooperative supper which is to be at 6:30, Tuesday evening, October 19, at the United Presbyterian church. The supper will be followed by a special program. Slide films will be shown and there will be special music. If parents are unable to attend the supper, everyone is asked to not miss the free pictures at 7:30 p.m. <clipping> Miss Elizabeth A. Smart, National WCTU Legislative Director, Washington D.C., was elected National WCTU Corresponding Secretary. The Nov. issue of the WCTU champion gives the sad news that on Oct. 10, 1948, Mrs. Jessie Earkart passed away after a heart attack while at morning worship in her church. She was director of the STI department, Iowa WCTU. We who were so fortunate as to be present when she spoke in Searsboro and in Grinnell remember her talent and her personal charm. Mrs. Emily Hamilton was bereaved of a brother in October. The Secretary sent her a card of sympathy form the WCTU of Grinnell. The October 1948 meeting of the WCTU was held at 6:30 p.m. October 19 at the U.P. church. As indicated in the clippings, the YTC met jointly with the WCTU as their own Oct. meeting. The potluck was enjoyed in the basement. Devotion was by Rev. Charles O. Whitely. After the meal, we went upstairs. Mrs. Whitely read the devotions. Mrs. Allen gave a report of the state convention in Marshalltown. Mrs. McBlain presided, and introduced Mr. and Mrs. Cox. Mrs. Cox introduced her companions from Newton, Mrs. Sabin, Mrs. Parks and Mrs. Neifert. Mrs. Cox, assisted by Mr. Cox, showed four slide films. Several members of the YTC were present. They gave two numbers. A call was made for any who wished to join any group, or pay any dues. Adjourned. Ada Park, secy. At the Nov. meeting, the minutes were read, corrected, amended and accepted. Song by Wilma Wylie. Item by Edith Criswell. 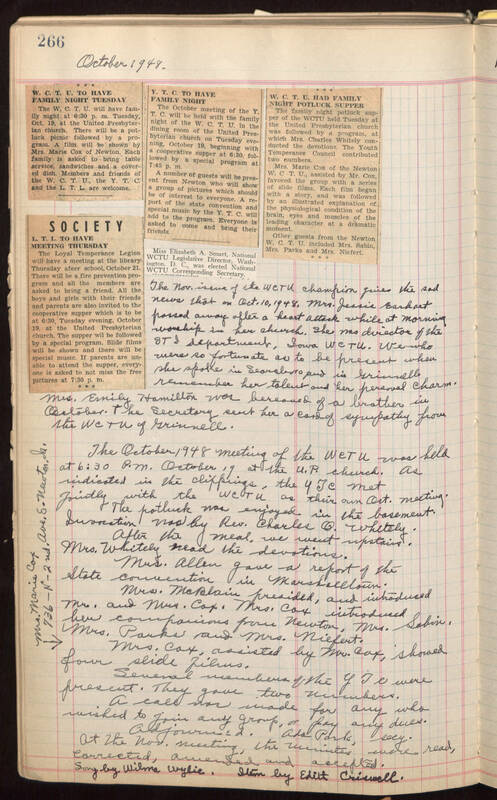 <addition on side of page> Mrs. Marie Cox 736-N-2nd. Ave. E. Newton, Ia. October 1948 W.C.T.U. TO HAVE FAMILY NIGHT TUESDAY The W.C.T.U. will have family night at 6:30 p.m. Tuesday, Oct. 19, at the United Presbyterian church. There will be a potluck picnic followed by a program. A film will be shown by Mrs. Marie Cox of Newton. Each family is asked to bring table service, sandwiches, and a covered dish. Members and friends of the W.C.T.U., the Y.T.C., and the L.T.L. are welcome. Y.T.C. TO HAVE FAMILY NIGHT The October Meeting of the Y.T.C. will be held with the family night of the W.C.T.U. in the dining room of the United Presbyterian church on Tuesday evening, October 19, beginning with a cooperative supper at 6:30, followed by a special program at 7:45 p.m. A number of guests will be present from Newton who will show a group of pictures which should be of interest to everyone. A report of the state convention and special music by the Y.T.C. will add to the program. Everyone is asked to come and bring their friends. W.C.T.U. HAD FAMILY NIGHT POTLUCK SUPPER The family night potluck supper of the WCTU held Tuesday at the United Presbyterian church was followed by a program, at which Mrs. Charles Whitely conducted the devotions. The Youth Temperance Council contributed two numbers. Mrs. Marie Cox of the Newton W.C.T.U., assisted by Mr. Cox, favored the group with a series of slide films. Each film began with a story, and was followed by an illustrated explanation of the physiological condition of the brain, eyes and muscles of the leading character at a dramatic moment. Other guests from the Newton W.C.T.U. included Mrs. Sabin, Mrs. Parks and Mrs. Niefert. SOCIETY L.T.L. TO HAVE MEETING THURSDAY The Loyal Temperance Legion will have a meeting at the lirary Thursday after school, October 21. There will be a fire prevention program and all the members are asked to bring a friend. All the boys and girls with their friends and parents are also invited to the cooperative supper which is to be at 6:30, Tuesday evening, October 19, at the United Presbyterian church. The supper will be followed by a special program. Slide films will be shown and there will be special music. If parents are unable to attend the supper, everyone is asked to not miss the free pictures at 7:30 p.m. Miss Elizabeth A. Smart, National WCTU Legislative Director, Washington D.C., was elected National WCTU Corresponding Secretary. The Nov. issue of the WCTU champion gives the sad news that on Oct. 10, 1948, Mrs. Jessie Earkart passed away after a heart attack while at morning worship in her church. She was director of the STI department, Iowa WCTU. We who were so fortunate as to be present when she spoke in Searsboro and in Grinnell remember her talent and her personal charm. Mrs. Emily Hamilton was bereaved of a brother in October. The Secretary sent her a card of sympathy form the WCTU of Grinnell. The October 1948 meeting of the WCTU was held at 6:30 p.m. October 19 at the U.P. church. As indicated in the clippings, the YTC met jointly with the WCTU as their own Oct. meeting. The potluck was enjoyed in the basement. Devotion was by Rev. Charles O. Whitely. After the meal, we went upstairs. Mrs. Whitely read the devotions. Mrs. Allen gave a report of the state convention in Marshalltown. Mrs. McBlain presided, and introduced Mr. and Mrs. Cox. Mrs. Cox introduced her companions from Newton, Mrs. Sabin, Mrs. Parks and Mrs. Neifert. Mrs. Cox, assisted by Mr. Cox, showed four slide films. Several members of the YTC were present. They gave two numbers. A call was made for any who wished to join any group, or pay any dues. Adjourned. Ada Park, secy. At the Nov. meeting, the minutes were read, corrected, amended and accepted. Song by Wilma Wylie. Item by Edith Criswell. Mrs. Marie Cox 736-N-2nd. Ave. E. Newton, Ia.